It began life as the Saffron Walden Antiquarian Society, founded by Mr William J. Fancett in October 1933. He became the President and retained this position for 29 years. The early meetings were held at his house at 16 Church Street, until a larger venue was required, when they moved to the Masonic Hall and later to Cambridge House. There were talks in the winter months, held at first on Thursday evenings and several outings organised during the summer. The scope of the Society was to be as wide as possible, to include all forms of antiquarian interest. The first lecture in November 1933 certainly lived up to this width of scope, as the President talked on the craft of building, ‘from Pre-historic Times to Sir Christopher Wren’! The following summer the first Society outing took place to Castle Hedingham. The early records do not give very much detail about activities, although there are the names of officers and committee members which cannot all be recorded here. The first secretary was Mr H. Downton, who gave up office soon after the war and the first treasurer was Mr B.E. Chapman, who held the post from 1934 until 1954. After this he continued to act in an advisory capacity until 1968 and remained a committee member, but the everyday management of the accounts was taken on by the secretary, since Mr Chapman was often away from the town. During all that time, from 1933 to 1968, there only seems to have been one increase in the subscription rate, so the finances were obviously well managed! The annual subscription began in 1933 at 2s 6d and was not increased until 1955, when it was doubled to five shillings; this was felt to be necessary because the Society’s funds had reduced to 10s 1d. There was another increase in 1969 when the subscription was doubled again to ten shillings and at that time a student subscription and a family rate were introduced. Not surprisingly the Society’s activities were curtailed in 1939 as war approached and were not revived until April 1946 when peace had been restored. Outings were soon being conducted again and Audley End Mansion was visited more than once, ‘by kind permission of Lord Braybrooke’, with the caretaker conducting a two-hour tour of the house. Presumably this was the first time such a visit had been possible. Mr Fancett gave a lecture on the history of Audley End in 1948 and later one on the history of Saffron Walden Parish Church, afterwards leading a tour of the church himself. He frequently gave talks to the Society, including an early one entitled ‘An Antiquarian’s Dream of Walden’ – unfortunately no details are recorded of what the dream contained. In 1947 Mrs Scrivener became the secretary, remaining in office for 18 years and her very detailed minutes and reports show the Society flourishing; for more than ten years of this time she was acting as treasurer as well. Evening lectures continued and an antiques evening was often held in the winter, when members could display their treasures. Up to seven outings were arranged each summer, some travelling as far afield as Warwick, Norwich, Lincoln, Maidstone and often to London, to name but a few of the many places visited. Shorter evening excursions would involve travel to two or three nearby villages, such as Little Easton and Great and Little Dunmow or Ashwell, Royston and Chrishall, usually touring the church and other buildings of interest. There were also visits to interesting historic houses like Spains Hall or Tiptofts, by arrangement with the owners. Mrs Scrivener recorded the visits keenly, with full details of the history of what was seen, but usually also reporting on the weather and where refreshments were taken, often noting the quality of the food! The organisation and planning of these outings is most impressive and mishaps were rare, so one can imagine the consternation caused when, on a visit to Chiswick House in 1959, another party was mistaken for the Saffron Walden Antiquarian Society and given not only their guide but also their tea! Mr Philip Dickinson FSA, who was the Huntingdon Borough Archivist, joined the Society in 1948. He soon became a committee member and led many successful expeditions. He was also a regular lecturer in the winter months, when his talks on such subjects as ‘Castles’, ‘Abbeys’ or ‘Cathedrals of England’ were much appreciated. When he resigned from the Society in 1962 because he was moving, one of the next outings was to St Ives, his new home, where he was again able to conduct a tour and entertain members. The Meeting changed its view and an amendment was carried by 15 votes to 5 in favour of disbanding. When this was done, it was then proposed that a new Society be formed, with a completely new name, its aim being to foster interest in all matters of Historical, Archaeological and Architectural interest, this was agreed unanimously. The meeting went on to choose the name of the new Society and the Saffron Walden Historical and Archaeological Society was finally agreed on. Mr Fancett’s reaction to this continuation in all but name is not recorded; he was invited to be the Patron of the new Society, although the minutes do not say whether he accepted. A report in the local paper records how many members at the meeting ‘spoke of the pleasure Mr Fancett had given them through the years with his interest and knowledge and genial personality’. He died in 1967 at the age of 93. There were some other changes of personnel during the 1960s. Three chairmen held office in fairly quick succession: Mr Godfrey (1963-65), Mr Chambers (1965-68) and Mr Lamont (1968-72). Miss Muriel Musto, a lecturer at the Saffron Walden Training College, took over as secretary and treasurer from Mrs Scrivener in 1965 and remained so for the next ten years; Mr Chapman, who had continued to help with finances, left the committee in 1968. Two other long-standing members of the committee, who had served on it since the early days in the 1930s, Miss Elizabeth Day and Mrs Dix both resigned in 1966.2 New committee members at this time included Mr Hunter, the Curator of Saffron Walden Museum and Mr Shaw-Ridler, the Librarian at Saffron Walden County Library. This was a period of transition, when the emphasis on the summer outings shifted a little and the regular programme of monthly evening meetings in the winter became more established. By the mid-1970s meetings were being held on a Monday evening in the King Street Library. Summer excursions were still organised, although not in quite such number and they often included a guided tour of a Cambridge college. In 1969 the Society reverted to its original name, the Saffron Walden Antiquarian Society, with a constitution adopted for the first time. One member objected and said that this name would have put him off joining, but others with fond memories of the early years did not agree and they won the day. Mr John Gerard O’Leary, FSA, joined the committee in 1969, he was made Vice-President in 1970 and soon proposed that the Society should publish a journal, which he agreed to edit. Saffron Walden History, the occasional journal of the Saffron Walden Antiquarian Society first appeared in May 1972 and 200 copies were produced at a cost of just over £26. It was very successful, usually two issues were produced each year and under Mr O’Leary’s editorship it became a vital repository of local research and knowledge. Its production was one of the great achievements of the Society, as it still is today. John G. O’Leary had had a distinguished career in the Essex Library Service, before he retired to Saffron Walden.3 His editorials, encouraging members into researching their local history and suggesting avenues by which they could approach this, are still inspiring today. He continued as editor until failing eyesight forced him to give up the task in 1981. He died in 1985. In 1972 Mr John Lankester became chairman of the Society and held the post for ten years. Some years before he had purchased the famous old building, the Sun Inn, which he restored and it became the book and antique shop which it still is today, now run by his son. At the 1976 AGM, the chairman gave members an interesting, illustrated account of how the building had been restored. During these years the Society began to flourish again, after it had reached a low membership in the early 1970s. Mr Neville Price took over as treasurer in 1975, thus separating the role from that of the secretary. He also did much to help with the production of the Journal; the actual duplicating was done using the facilities of the Training College, through the auspices of Miss Musto. She resigned as secretary in 1975, but continued on the committee until she moved from the town in 1977, when the College closed. During these years Mr H.C. (Cliff) Stacey was a very active member of the Society. He had been the Town Clerk and had done a great deal to preserve the town archives of which he had an extensive knowledge.4 He was a frequent contributor to the Journal on a great variety of subjects and it became a popular tradition for him to give a talk on ‘Old Saffron Walden’ each year, illustrated from his wide collection of slides and other materials and full of anecdotes from his long knowledge of the town and its inhabitants. In 1974 Cliff Stacey was made a Vice-President of the Society. Over the years the Society had concerned itself with a number of local issues which caused concern. Soon after the war, the state of the Battle Ditches and then later of the turf maze on the Common, had led to letters being written to the Town Council and improvements being made. In the 1960s the Society supported the North West Essex Preservation Society in its fight to prevent Stansted being expanded as a third London airport. In 1977 the gates of the Anglo-American Memorial Playing Fields were discovered by two committee members, Mr Richard Jemmett and Mr Harry Howson, to be lying derelict. The Town Clerk was informed, but the Society considered that these gates, with their history, were so important that they arranged for a local builder to remove and repair them.5 A sum of £50 was guaranteed from Society funds for this work, plus contributions from members and Scott & Bow, who repaired the gates. They were re-erected in 1978, since when they have been cared for by the Town Council. In the same year concern about heavy lorries passing through the town and damaging ancient buildings, led to the pavement being widened and raised outside the Sun Inn. It will be noted that some of these issues are still causes for concern today. Donations from Society funds were also made to other worthy causes in the town over the years, such as the re-binding of valuable old books in the Town Library, repainting or blazoning the coat of arms on the Town Hall in its correct colours in 1951 and contributing to the restoration of the Town Fountain in the Market Square in 1975. More recently the Society has continued this tradition by contributing to the Museum Appeal for the Heritage Quest Centre and also supporting the appeal fund of the Victoria County History of Essex. Miss Dorothy Humphreys took over as secretary from Muriel Musto in 1975 and continued to do sterling work of organisation on the programme of lectures and outings, leaving detailed minutes and reports. The Society had continued to grow and in 1978 meetings were moved from the library to the Friends’ Meeting House, where there was more room. 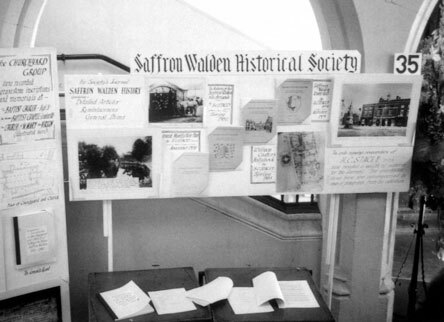 By the time the 50th Anniversary was celebrated in 1983, there were changes again, one being a final change of name to the one we use today, the Saffron Walden Historical Society. John Lankester had resigned as chairman in 1982 on grounds of health and he agreed to become a third honorary Vice-President. 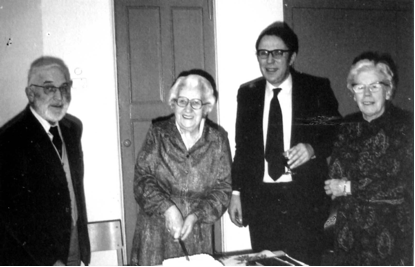 Miss Winnie Foster cutting the Society’s 50th anniversary cake in 1983, alongside John Lankester (left), chairman Tim Pratt and secretary Dorothy Humphreys. The Society’s display at the 1984 History Day. The programme for the day contained a town trail which visitors could follow to see many of its most interesting features. The whole day seems to have been a great success and there were over 3,000 visitors. This History Day set the pattern for the series of biennial Essex History Fairs, which have continued since then: the next was held at Castle Hedingham in 1986, in which the Society also took part by having a stall. Miss Winnie Foster resigned as vice-chairman in 1984, but a few years later in 1988 she was made a Vice-President. Her place as vice-chairman was taken by Dorothy Humphries, who now resigned as secretary. Mrs Catherine Pearce took over as secretary from 1984 until 1987 when she moved from the town and Dorothy then valiantly agreed to take on the task again on a temporary basis, as well as her other role, until a new secretary could be found. A major event and a cause of some disquiet in the Society was the decision by the Town Council to celebrate 1986 as the 750th Anniversary of the town’s first charter. This undated charter, issued by Humphrey de Bohun, was considered by some to date from 1236 and this date had been later written in pencil on the back of the charter. The dating was however controversial, as there were several Humphrey de Bohuns and it was more likely that the charter dated from about 1300. There was much discussion and correspondence about the date, but the Council went ahead with their plans and the majority of the Society’s committee agreed to take part in the celebrations, in spite of the suspect dating. However Mr Cliff Stacey, who disagreed strongly with the 1236 date, decided to resign as a Vice-President and also from the Society over the issue, so that he could express his views more freely. Mr Neville Price was already the Society’s treasurer and since the closure of the Training College in 1977 and the loss of their facilities, he had taken on the typing and production of the Journal, using the duplicator at the Baptist Church. In 1981 he also took over the responsibility of editing the Journal from John O’Leary. He and his wife Jean had in addition done a great deal of work taking part in the North West Essex Graveyard Survey. Together with some other members of the Society, they recorded all the gravestones in St Mary’s churchyard, as far as they were legible. They then went on to record the other gravestones in the town, at the United Reformed Church, the Friends’ Meeting House and the Baptist Church and various other sites where churches had existed. These records were all typed and copies were lodged in various places such as the Essex Record Office and the Library. It is an impressive and useful piece of work. In 1987 Mr Charles Waite became the new chairman, having already served on the committee for several years. With Mrs Betty Byrom and others he had been involved in working on the census records for the town, comparing Castle Street and Church Street in the 1841 and 1851 censuses. He continued as chairman for twelve years until 1999, presiding graciously at meetings and entertaining members with many talks at annual general meetings, often about research into his family history, with humorous twists to the tale. A tragic loss to the Society occurred during this time in September 1988, when Dorothy Humphries, who had served it so well, died suddenly whilst away on holiday. There was an urgent need for a new secretary and there was relief when Mrs Jane Bankes-Jones volunteered her services in 1989, after reading about the Society in a newspaper report. She continued in the role, most effectively, until she resigned in 2002. There was another sad loss to the Society and the town in 1990, when Mrs Mary Whiteman died. She had lived in Saffron Walden since 1938 and had been Librarian; her great interests were the Town Library and local history, she had long been a member of the Society and had frequently given talks to it. It was decided that the Society would hold an annual lecture in October in her memory and this still continues. In 1992 Miss Winnie Foster moved away from the town for health reasons. Since she was the longest serving member of the Society, it was felt fitting that she should be recognised as Honorary President. She kept in touch with the activities of the Society until she died in 1995. Mr Kenneth Neale OBE. FSA. had long been a valued and supportive co-opted member of the committee. He had often given wise advice and had greatly helped the secretaries in finding speakers. He had had a distinguished career in the Civil Service and had been Chairman of the Essex Archaeological and Historical Congress, as well as Chairman of the Sampfords Society. He decided to resign from the committee in 2000, but the Historical Society were delighted when he agreed to accept the invitation to become our current Honorary Life President, a post he held under his death. So this account reaches the present. The Rev. Canon Michael Swindlehurst succeeded Charles Waite as chairman in 1999, and Mike Hibbs became chairman in 2018. Charles Waite was made a Vice-President until his death. Richard Jemmett continued to serve as treasurer from 1985 until 2013, and contributed in many other ways, including giving many talks with his splendid collection of slides and working his projector for other speakers on numerous occasions. He is now a Vice-President. Malcolm White, former Town Clerk, took over as treasurer in 2013, while Kathryn Fiddock continues her sterling work as secretary, a post she has held since 2002. Probably the most important event in recent years has been the revival of the Society’s Journal. The second series began in the spring 2001, initially mooted by Sarah Kirkpatrick and Bruce Tice, but then taken on by Jacqueline Cooper, the current editor, now assisted by Martyn Everett. It continues to go from strength to strength enabling many historians to see their work into print. Apart from the publication of Jennifer Ward’s booklet on the town charter, the Society had not published any further books until 2009 when the Journal Editor proposed beginning a series of full-length books to be called SWHS Publications. This was initially funded through profits on the Journal, and is now self-supporting, with four titles so far: Land, Agriculture & Industry (2009) by Geoffrey Ball; The Place Names of Saffron Walden (2011) by Malcolm White; Sir Thomas Smith: scholar, statesman and son of Saffron Walden (2012) by Jeremy Collingwod; and Chepyng Walden: a Late Medieval Small Town – Saffron Walden 1438-1490 by Elizabeth Allen (2014). It has been impossible to mention all those members who have served the society so loyally and well over the past decades. There have of course been many changes, but much of the essential Society from those early years has remained the same. Long may it continue to be so! 1. Saffron Walden History Journal, 1st series No 25. Spring 1984, pp. 23-36. 2. Obituary of Elizabeth Day: Saffron Walden History Journal, No 16. Autumn 1979, pp. 227-230. 3. ‘A Tribute to John O’Leary’: Saffron Walden History Journal, No.21, Spring 1982, p. 121; No. 29. Spring 1986 p. 122. 4. ‘An account of cataloguing the archives’ by H.C. Stacey: Saffron Walden History Journal, 1st series No 32. Autumn 1987, pp. 212-217. 5. The gates came originally from Shortgrove Hall and were erected at the Castle Street entrance to the Memorial Playing Fields in 1955, as part of the Anglo-American Memorial to the U.S. airmen who were killed in World War II. 6. Foster, W.E. ‘Memories of the Boys’ British School’: Saffron Walden History Journal, No 25. Spring 1984, pp. 9-12. 7.Steven Bassett was Medieval Archaeology lecturer at the University of Birmingham, who did excavations in Walden. 8. Mary Whiteman was a local historian and Town Librarian. 9. The three public lectures were by Malcolm White on the town archives, Mary Whiteman on Susannah Day,, and by Dr J. D. Williams on Audley End and Sir John Griffin Griffin. 10. Obituary Neville Price: Saffron Walden Historical Journal, No. 3. Spring 2002, p.23.